I think we can nearly unanimously agree that cheesecake is delicious. But I think we can also nearly unanimously agree that making cheesecake can be a lot of work. The lining of the cheesecake pan. The water bath. The nearly 3 pounds of cream cheese necessary to get those thick, fat slices. Always worth it, but not always possible to fit into our busy schedules. 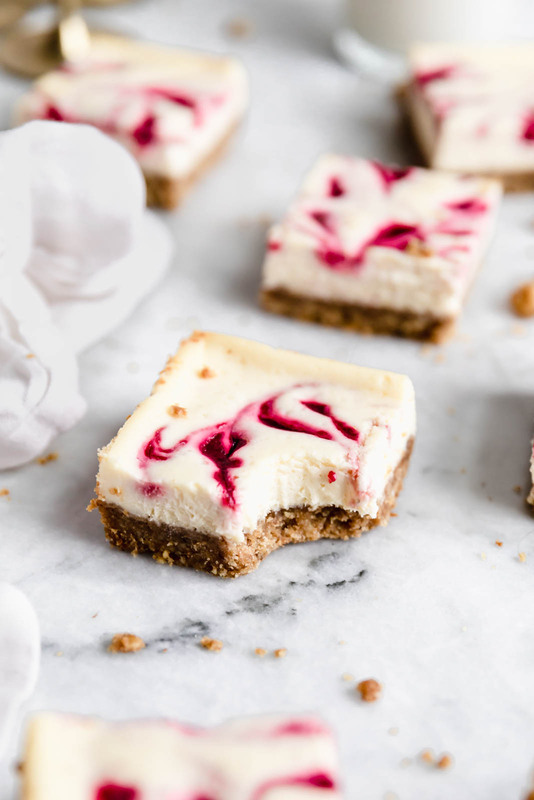 Cheesecake bars, on the other hand, make cheesecake more accessible, more easy to make, and — woohoo! — more easy to consume. 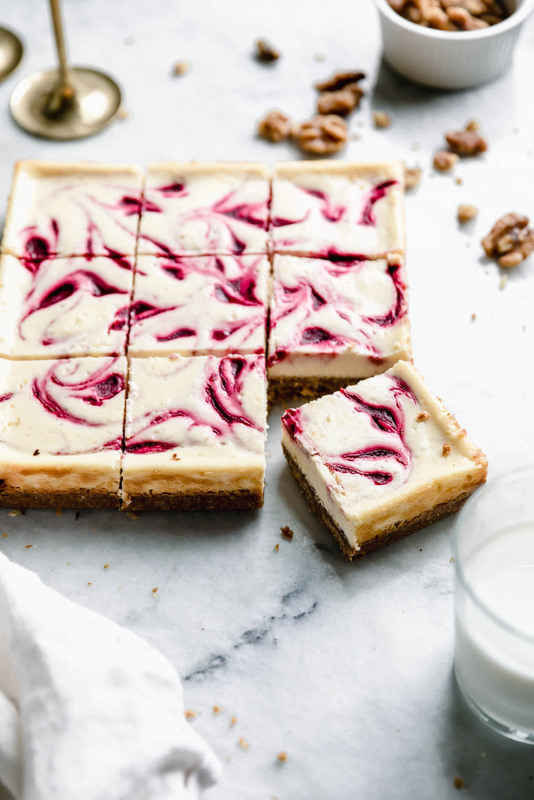 These Walnut Cranberry Cheesecake Bars are the perfect fall cheesecake that you need in your life. They’re creamy, luxurious, and flavored with cranberries, orange zest, and a walnut graham cracker crust. 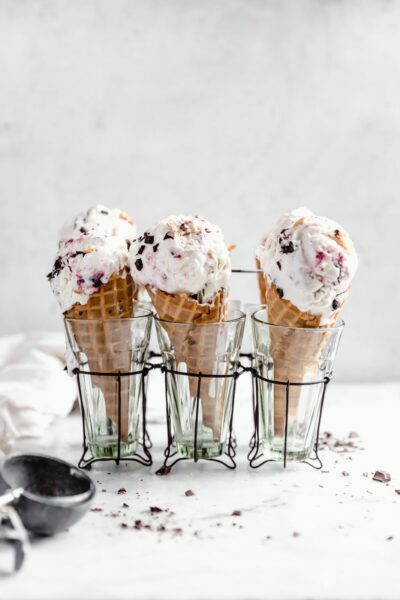 They fit into nearly every type of situation: for hanging out solo and eating a cheesecake bar, for taking to a party, for making for Thanksgiving or Christmas, for baking with your friends. All of it. One way I like to elevate these bars, besides making them with the delicious flavor combo of cranberry walnut, is to use crème fraîche instead of sour cream. 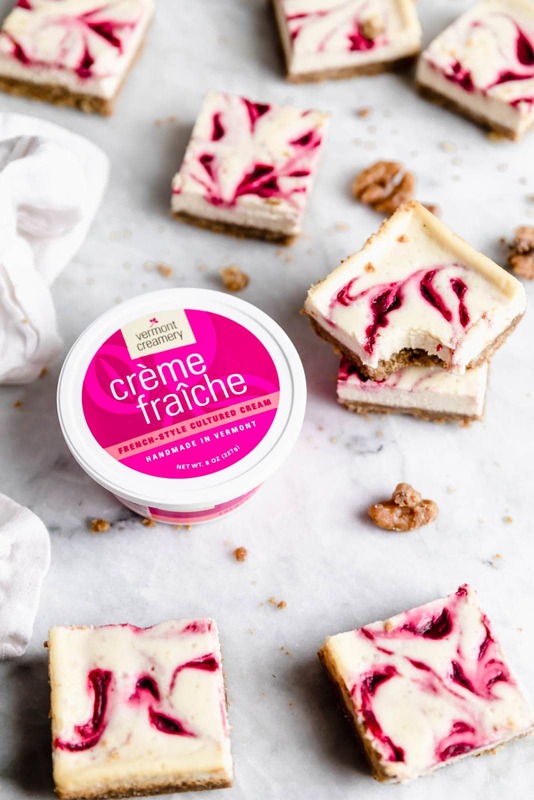 Using crème fraîche makes these bars extra creamy, and adds a subtle hint of tang that you wouldn’t otherwise get if using just cream cheese. My favorite crème fraîche comes from Vermont Creamery, because it’s mild, creamy, and made with fresh cow’s milk. You could even dollop some crème fraîche on top of these bars to really complete the experience. That would be such a gorgeous presentation! Prep the cranberry topping — The cranberry swirl on top of these cheesecake bars is a simple mixture of frozen cranberries, white sugar, water, and orange zest. Cook that down in a small pot until the cranberries break down completely, and then set aside to cool. Make the walnut crust — The crust takes less than 5 minutes to whip up, thanks to my good friend the food processor. Add all the crust ingredients into the food processor and blend until it resembles fine sand. Press the walnut crust into a greased pan and set aside while you make the cheesecake filling. Make the cheesecake filling — The creamy cheesecake filling is made of cream cheese, crème fraîche, eggs, vanilla, and powdered sugar. Beat all that together in a standing mixture, and then pour over the walnut crust. 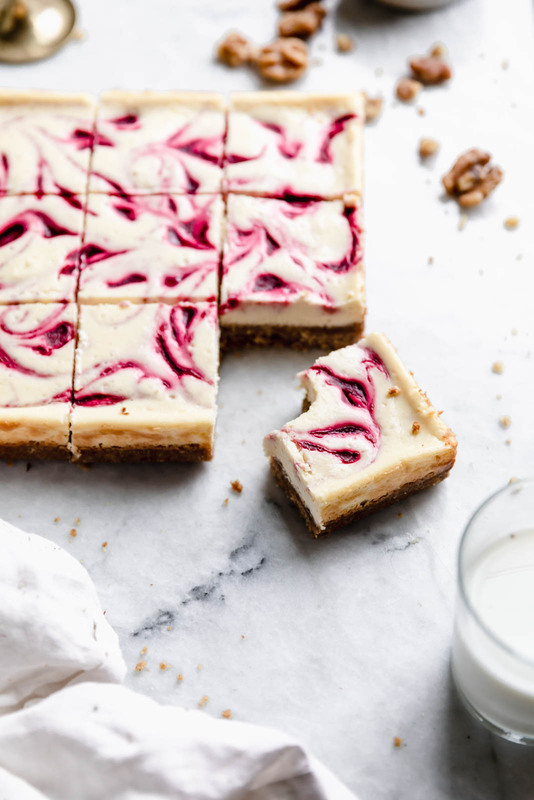 Swirl the cranberry puree into the cheesecake and bake. Bake and cool — The hardest part of this recipe is waiting for the cheesecake bars to cool. You first need to let them come to room temperature on your counter and then they have to chill in the fridge for a few hours. 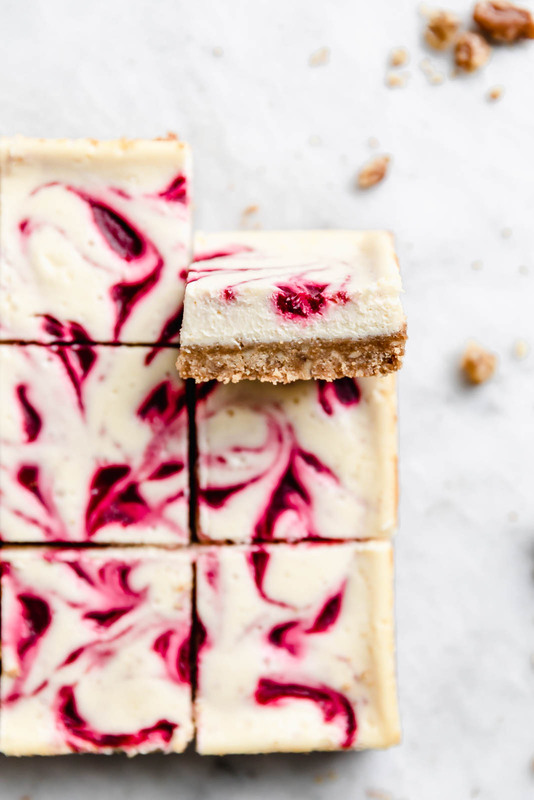 Waiting is torture, I know, but that first bite of perfectly creamy cranberry cheesecake bar will be so worth it. Just like cheesecake, these bars should be kept in an airtight container in the fridge. They should keep well for up to a week, although they didn’t last that long at my house. I suppose you could also freeze these bars if you wanted to and then pop them into the fridge the day before you want one. I haven’t tried this method for myself, but I see no reason why it wouldn’t work! 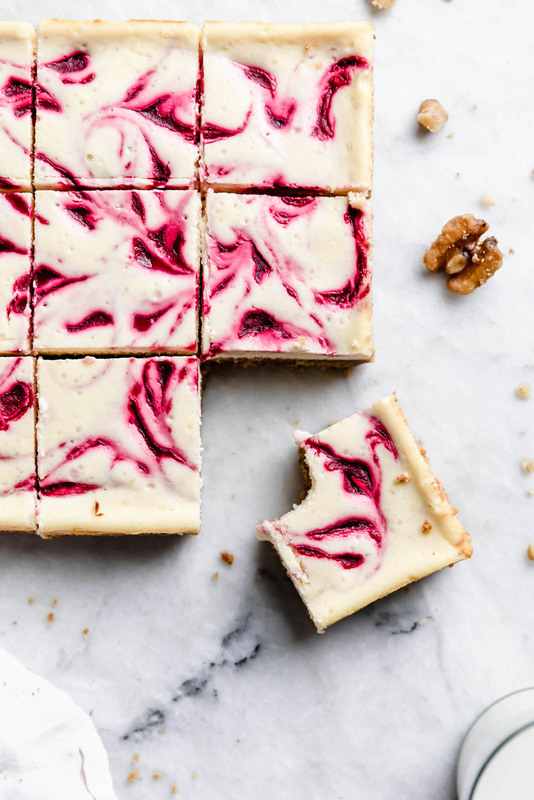 Totally creamy, slightly nutty, and utterly delicious, these Walnut Cranberry Cheesecake Bars make for a crowd pleasing winter dessert! Once cooked, place a fine mesh strainer over a small bowl and, using a spatula, squeeze through all of the liquid and dispose of the solids. Let cool to room temperature. Preheat oven to 325°F. Line an 8×8 pan with parchment paper. This post is sponsored by Vermont Creamery. All text and opinions are 100% my own. Thank you for supporting the brands who help make Broma possible! Cheesecake bars! A little easier than a cheesecake and just as yummy! Cranberry-walnut bars sound so delicious for Fall! Those cranberry swirls are just GORGEOUS! Love this combo, can’t wait to try them. Pinned! What tasty bars for the holidays Sarah! Bet these will disappear quickly! Love the Crème Fraîche addition! These look incredible and I love how much easier they are than a traditional cheesecake! OMG I would so eat all the 3 lbs of cream cheese. Because these bars are worth it. Swirl worthy! The prettiest bars, I love the cranberry swirl! Do you use raw walnuts?